Alison Hill’s latest book is a collection of poems and songs on a single theme contributed by 45 people. She has edited the book in a creative style. 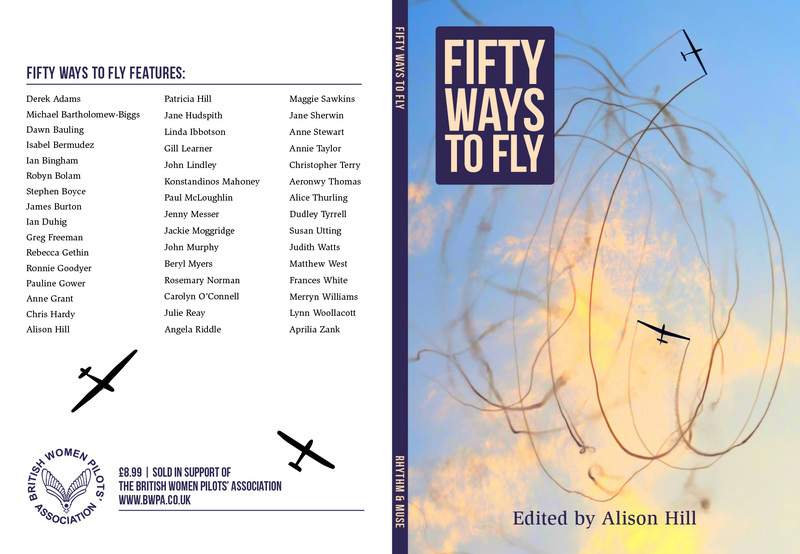 ‘Fifty Ways to Fly,’ includes a poem by Jackie Moggridge which is published posthumously for the first time. It was discovered by Jackie’s daughter Candy amongst her mother’s memorabilia. ‘The Last Flight,’ is very moving. Jackie had written it on the back of an ATA snag report chit dated 1943. Also republished is a humorous poem by Pauline Gower called ‘Ten Little Aeroplanes‘. Originally one of the ‘Piffling Poems for Pilots,’ Pauline’s son Michael Fahie is delighted to give permission for it to be one of the ‘Fifty Ways’. 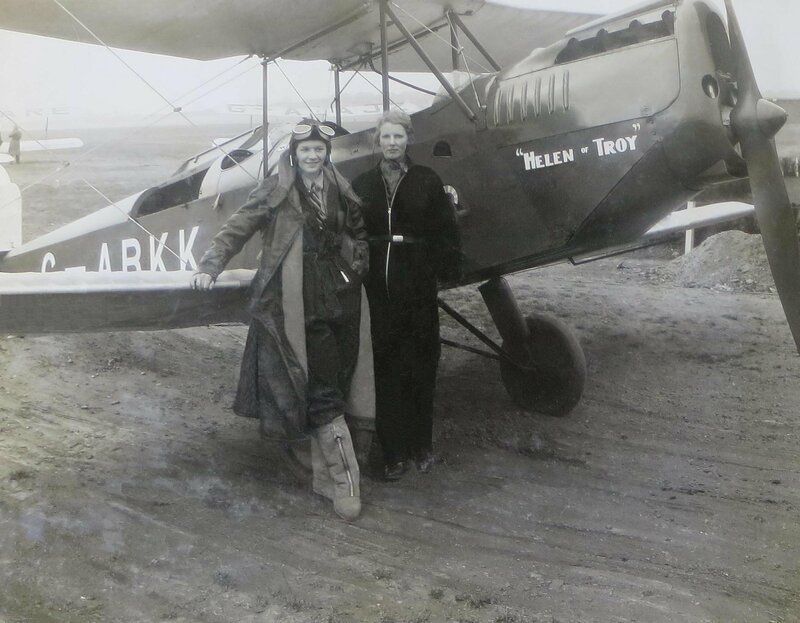 Other contributors include Alison herself with her tribute to Jackie Moggridge and Ian Duhig has penned a tribute to the immortal Amy with, ‘The Last Testament Of Amy Johnson‘. Look closely at the cover image and you may spot yours truly listed. My offering is, ‘Prayer for Freedom Flight’. I’m proud to appear in the same publication as Pauline Gower and Jackie Moggridge. Alison Hill will be reading from ‘Fifty Ways to Fly‘ anthology, on Sunday, 17th September 2017 at The Square Tower, Old Portsmouth. It is organised by Tongues and Grooves, run by poet Maggie Sawkins, who has two poems in the anthology. All profits from the book sale will go to British Women’s Pilot Association. Copies of the book are available by following this link to Alison Hill. 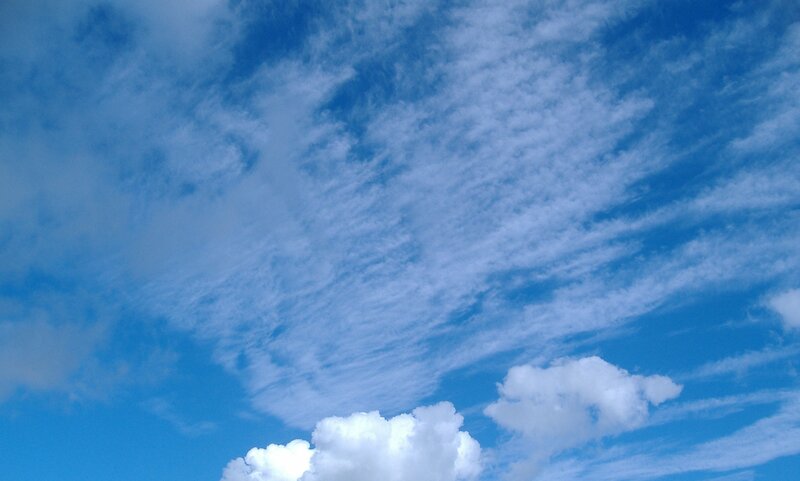 For news of other aviation events in the Solent area this year go to the Notice Board. Don’t miss the Southwick Revival and Daedalus 100. There are also two research projects asking for help and your anecdotes. Plus an Aviation Art Society is open to new members. Seventy years ago the Air Transport Auxiliary was closed down, following the end of WW2. On 29th September 1945, an Air Pageant was held at White Waltham and the public were shown the work of A.T.A. In 1998 I was given a copy of a rarely seen photograph of A.T.A. personnel, taken at White Waltham. Even the late, great, Lettice Curtis had not seen this until she too received a copy of it in 1998. The lady who gave me the photo was Marjorie McKinven. She worked for A.T.A. for six years, in other words from the start to the very end. 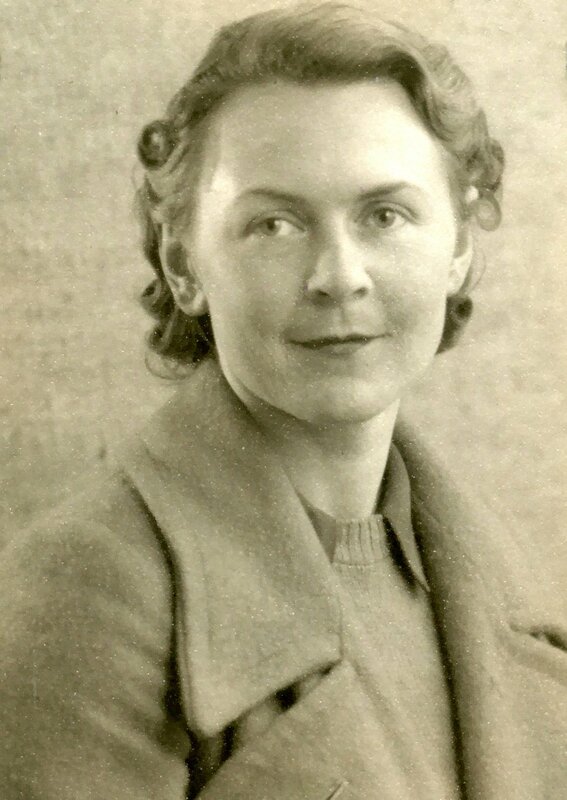 Employed as a civilian, she was a secretary in the Operations Room and typed the aircraft collection chits. Marjorie saw all the pilots, male and female, as they came into her office to collect their chits. In the photo Marjorie is the petite lady stood on the left in the light coloured coat, middle row. Next to Marjorie is Lettice Curtis, plus twelve other women pilots. In the same row is another lady, second from right, Miss Gold, also wearing a light coloured coat. She worked in the Operations Room with Marjorie. In that same row can be seen Jennie Broad, eighth from left. Eleventh from left and sixth from right, is Naomi Allen (nee Heron-Maxwell). Jennie’s story and Naomi’s story will be added to this website soon. They were both based at Hamble. 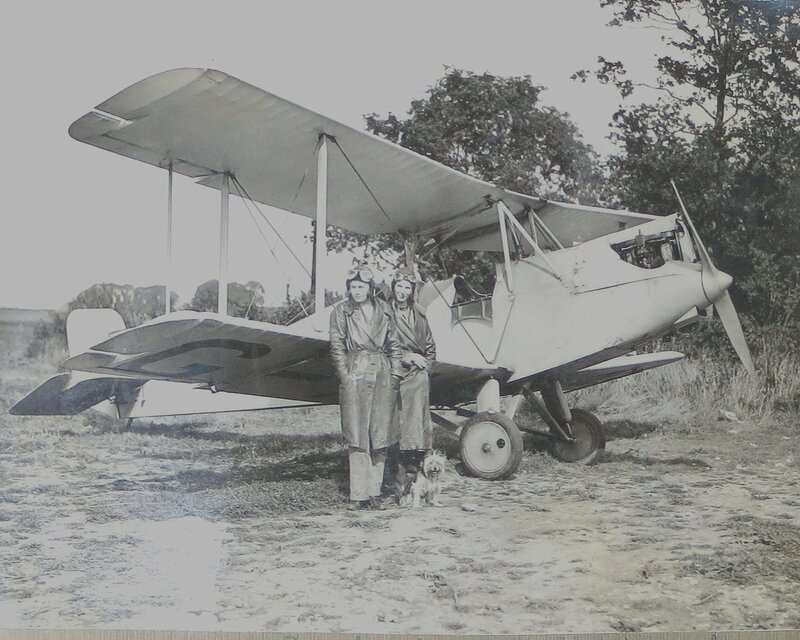 Marjorie couldn’t be more precise than that but by using the dates of A.T.A service in ‘Forgotten Pilots’ by Lettice Curtis, it is possible to narrow down when the photograph was taken. Naomi Allen joined on 24th February 1942 and Jennie Broad left on 11th June 1943. 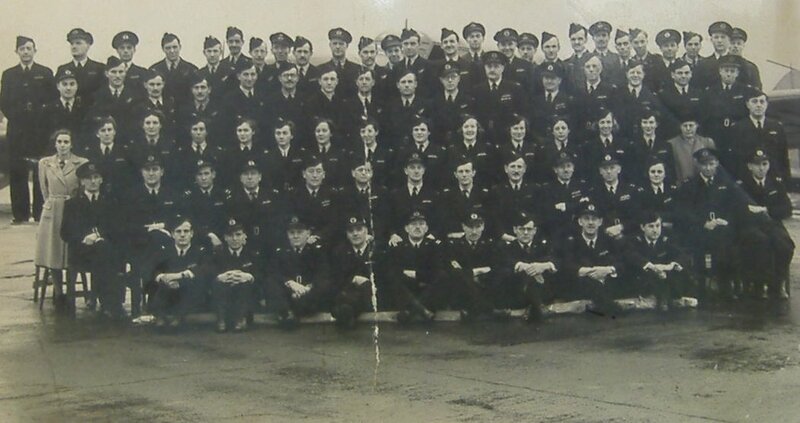 All new pilots had to go through a conversion course, which took at least a week, so Naomi wouldn’t have been available for a photo-shoot until March 1942 at the earliest. If Jennie ever had a copy of this photo, it no longer exists, as her photo collection was destroyed. Knowing what we know today, with all the books that have been written about the ATA, Marjorie’s comment, made in 1998, is perhaps surprising to us now. But that best demonstrates the secret nature of so much that went on during the war. Everyone was only told on a ‘need to know’ basis and too much talk of pilot deaths would have been bad for morale. It was impossible to keep news of fatalities from the other pilots though. Mary Wilkins (Ellis) knew that her friend Dora Lang had died. Both women were based at Hamble. Dora’s death hit Mary hard, and she was unable to fly for a few days. If anyone can help to identify the other pilots in this photograph, male and female, please contact me. Thank you for your contribution Danica. 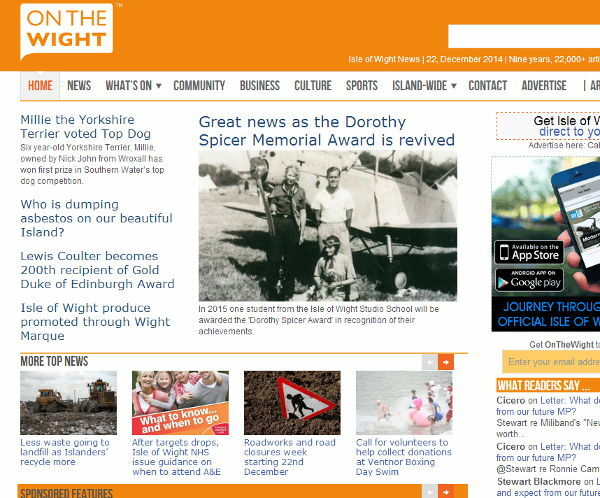 Dorothy Spicer Memorial Award featured OnTheWight. Click here to read the story. Eighty years ago in 1934, Dorothy Spicer broke through the all-male barrier against women training for an advanced qualification in aviation engineering. Women were barred from studying at technical schools for the Ground Engineers ‘B’ licence. Dorothy found a way around the blockage. Who would have thought that the Isle of Wight would play such an important part in helping Dorothy to set a world record. The Island, so often thought of as being decades behind mainland England, actually provided Miss Spicer with the training she needed. Dorothy’s full story is here.